This Thai Mango Grilled Chicken recipe is a gourmet delight and it's easy to whip up. A twist on traditional mango chicken, this grilled version is equally delicious and just as spicy-sweet! Simply toss some ripe mango into your blender together with a few other Thai ingredients and you have a delicious mango sauce that works wonderfully both as a marinade and dipping sauce. Serve with rice or a salad, and you'll make everyone happy at dinnertime. For tips on buying and cutting fresh mango, see my All About Mangoes Guide. Remove flesh from the mango, discarding the stone. Place the mango plus all mango sauce ingredients together in a blender or food processor. Process well to form a smooth mango sauce. Taste-test the sauce, looking for a balance between sweet & sour, salty and spicy (this sauce should taste more sweet than sour). Add more sugar if too sour, or more fish sauce if not salty or flavorful enough. Add more chili if not spicy enough. If using skinless chicken breast or thighs, score the uppermost side, slicing 1/8th to 1/4 inch deep - this will give your chicken more flavor. Chicken with skin will be lots flavorful enough without scoring. Place prepared chicken in a mixing bowl. Pour half to 2/3 of the mango sauce over, stirring well to combine. Set the rest aside for serving. Marinate chicken in the mango sauce at least 10 minutes, or up to 24 hours. 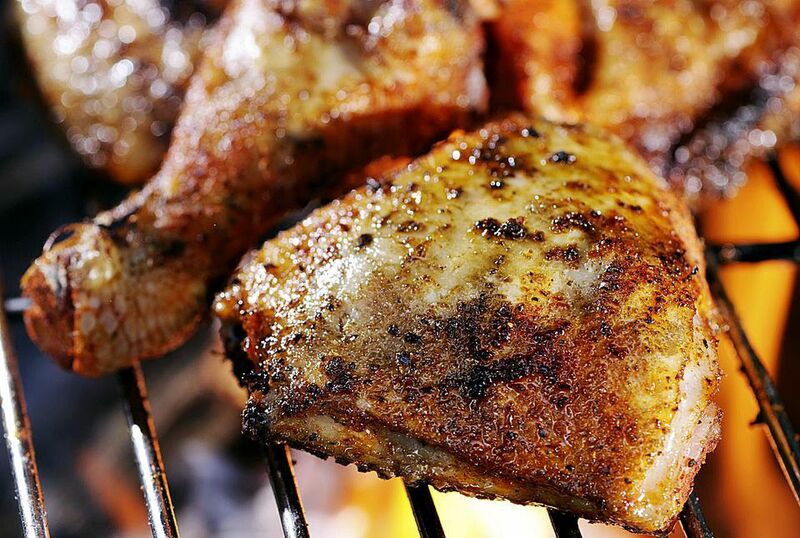 Before grilling, brush a little cooking oil over your grill to prevent sticking. As you grill, baste with leftover marinade (from the bottom of the bowl). Chicken is done when flesh turns light golden-brown and the juices run clear. Place reserved mango sauce in a sauce pan over medium heat, stirring until just warm (avoid boiling or you'll lose the fresh mango flavor). Or simply serve as a condiment at room temperature. Serve the grilled chicken together with the sauce. Excellent with rice or your choice of salad or potatoes. Or for an extra special treat, serve with my Easy Thai Coconut Rice. ENJOY!